The opening move in Britain's "southern strategy" to win control of its rebellious colonies in the American Revolutionary War was the December 1778 capture of Savannah, Georgia. This heightened concerns in Charleston, South Carolina, where General Benjamin Lincoln headed the Continental Army's southern command, and the British garrison at Savannah was about the same size as his own. By mid-April, Charleston was reinforced by the arrival of South Carolina militia, and Lincoln decided to attempt the capture of Augusta, Georgia, which was defended by a smaller garrison of British troops and Loyalists. He marched from Charleston on April 23. When British General Augustine Prevost learned of this movement, he decided to counterthrust against militia forces at Purrysburg, South Carolina, just upriver from Savannah, marching 2,500 men out on April 29. The militia at Purrysburg, about 1,000 men under the command of General William Moultrie, fell back toward Charleston rather than engaging Prevost, and sent messengers to Lincoln warning him of the British movement. Prevost decided to pursue them almost all the way to Charleston. On May 10, companies from the two forces skirmished near Ashley Ferry, about seven miles (11.3 km) from Charleston. Two days later Prevost intercepted a message from which he learned that Lincoln was rapidly marching back to Charleston, and decided to retreat. His army was slowed by having taken supplies en route, so he decided to leave a rear guard at Stono Ferry, between Johns Island and the mainland, removing most of his army to Savannah by boat on June 16. Prevost placed Lieutenant Colonel John Maitland in charge of the rear guard, which numbered about 900 men. A bridgehead was established on the north side of an area now known as New Cut Church Flats; this was meant to cover Stono Ferry. Three strong redoubts were built, circled by an abatis and manned by Highlanders and Hessians. Lincoln, on his arrival in Charleston, decided to mount an attack on this outpost. Even though he commanded five to seven thousand men, he was only able to raise about 1,200 men, primarily from the poorly-trained local militia, for the expedition. General Moultrie led a smaller secondary effort to the east against a small group of British soldiers on Johns Island. Lincoln deployed his troops after a night march of eight miles (13 km) from the Ashley Ferry, located in the present village of Drayton Hall. Immediately upon their arrival at dawn, they began struggling through thick woods. The Americans advanced in two wings; General Jethro Sumner led his Carolina militia on the right, carrying two guns, while their right flank was covered by a company of light infantry, commanded by the Marquis de Malmady. Continental Army troops, under General Isaac Huger, made up the left wing; they carried four guns into battle. With Huger was a group of light infantry under John Henderson, and it was these troops who, shortly before sunrise, made first contact with the enemy. The battle began well for the Patriots. They engaged the British positions with small arms and cannon fire for an hour, at which point they advanced to the abatis. Of the Highlanders, two companies resisted until only 11 men were left standing; a Hessian battalion finally broke. Here Maitland shifted his forces in an attempt to counter the larger threat posed by Huger's wing. The Hessians rallied and returned to the fight, and reserves were brought across the bridge. Lincoln chose this moment to order a withdrawal. 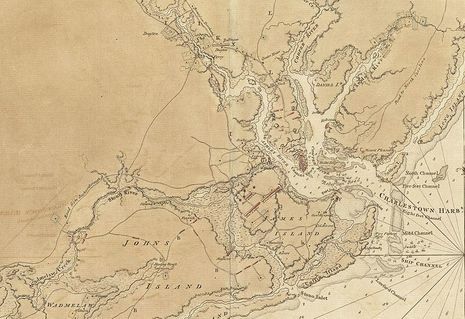 The Battle of Stono Ferry was a poorly planned and badly conducted military operation. It took place on June 20, 1779, in South Carolina during the British retreat from an abortive raid on Charleston. After the American defeat at the Battle of Brier Creek, Gen. Benjamin Lincoln again assembled a force to force the British out of Augusta. The British, under Gen. Augustine Prevost, marched from Savannah towards Charleston SC only to find the town defended by Gen. William Moultie. Moultrie heard of the British advance and hastily threw defensive works between the Ashley and Cooper rivers above the city. On May 12, upon learning of the defenses, Prevost withdrew the British forces. They withdrew to James Island and then to Stono Ferry, which was south of Charleston. John Maitland was in charge of the large rear guard left by General Augustine Prevost upon his withdrawal to Savannah. A bridgehead was established on the north side of an area now known as New Cut Church Flats; this was meant to cover Stono Ferry. Three strong redoubts were built, circled by an abatis and manned by Highlanders and Hessians. It was here that American Major General Benjamin Lincoln chose to lead his main attack. William Moultrie led a smaller secondary effort to the east against a small group of British soldiers on Johns Island. Lincoln deployed his troops after a night march of eight miles from the Ashley Ferry, located in the present village of Drayton Hall. Immediately upon their arrival at dawn, they began struggling through thick woods. The Americans advanced in two wings; General Jethro Sumner led his Carolina militia on the right, carrying two guns, while their right flank was covered by a company of light infantry, commanded by the Marquis de Malmady. Continental Army troops, under General Isaac Huger, made up the left wing; they carried four guns into battle. With Huger was a group of light infantry under John Henderson, and it was these troops who, shortly before sunrise, made first contact with the enemy. The rear guard consisted of 900 British, Hessians and Tories. Moultrie attacked mainly with militia who were no match for the defenders. In spite of this victory, Prevost withdrew his troops and abandoned South Carolina. At 150 dead and a comparable number missing, Patriot losses had been heavy; among the dead was Andrew Jackson's brother Hugh, felled by heat and exhaustion. Most of the "missing" were deserters; the British claimed no prisoners from the battle. Huger was severely wounded. For their part, the British lost 150 officers and men, but only one was reported missing. Maitland had decided almost a week prior to the battle to withdraw from battle; however, his action was delayed by a lack of water transportation. Finally, on June 23 he began moving towards Beaufort, although with little prompting from Lincoln's attack.